Built by apprentices from Babcock Engineering at Faslane to a design by burgh architect Ian Plenderleath, it was first display as part of the Comet bicentenary celebrations in Helensburgh in 2012. 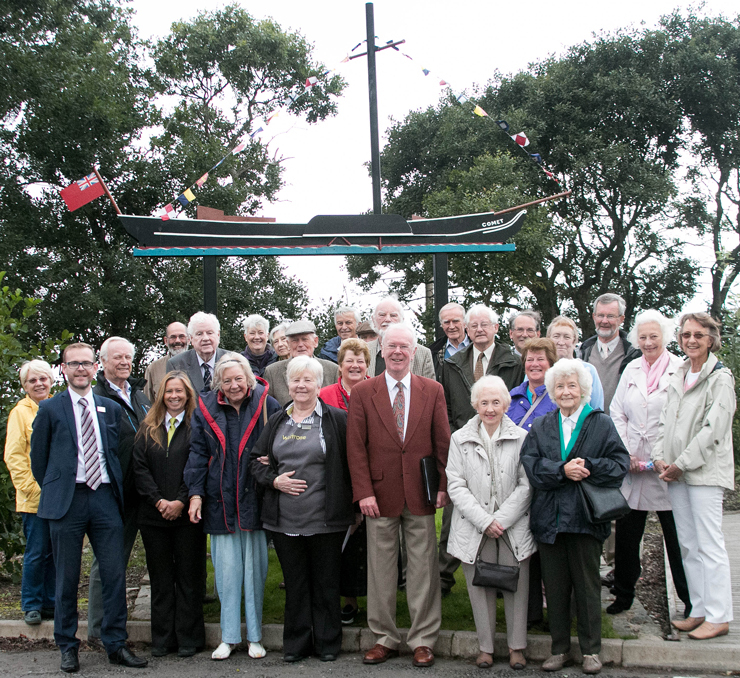 It was hoped that its permanent home could be near the pier, but Argyll and Bute Council’s area committee turned down the Trust’s offer to donate it. Instead, it was accepted by Waitrose. After various modifications it now stands on a specially landscaped area with the railway and the Clyde behind. 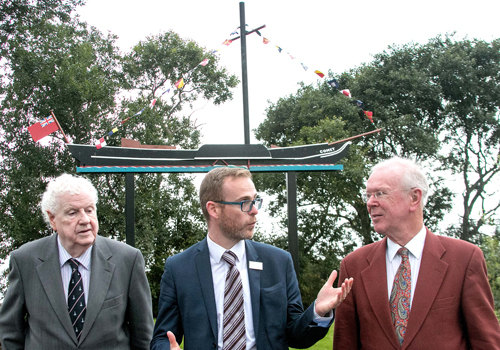 Trust treasurer Stewart Noble, who led the bicentenary celebrations, said: “Eight years ago I realised that the bicentenary of Henry Bell’s Comet was just four years away, and I thought that we really need to do some preparation for this. It has taken an extra four years finally to get everything finished off. "What we have here, I am delighted to say is this silhouette of Henry Bell’s Comet. "Henry Bell is one of the most important people, not just in Scottish economic history but arguably in British economic history, and there is even a book which has been written by John Ransome and says how this little ship changed the world. "You can argue that the importance of shipbuilding on the Clyde 100 years ago was largely down to Henry Bell. You can argue also that he was a pioneer of tourism in this part of Scotland, so he is definitely a man who deserves to be remembered a lot better than he probably has been. "So I was delighted that we were eventually able to get this one-third silhouette of the Comet erected here. "The man with the original idea was Ian Plenderleath. We also have here David Nicoll here who did the structural engineering which will ensure that it won’t fall down, Neil Macleod who painted flags, and Richard Schooling who helped with the rigging. "The steel work for the silhouette was done by Babcock Engineering at Faslane, and painting — actually a powder coating rather than paint — was by Highland Colour Coaters of Cumbernauld. "All these people and all these companies gave their services for producing the silhouette free of charge, and we are extremely grateful to every single one of them for all they did. 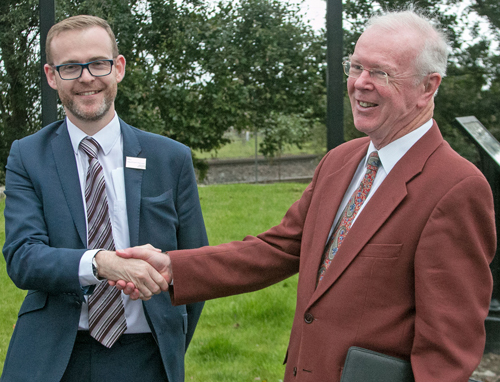 "I am delighted to be able to hand over the silhouette to Waitrose for their safe-keeping in future years." "It is nice to honour Henry Bell — I was the Provost and so was he! If he was alive today he would be 249 years of age. He came here aged 40 as the Provost, and you know if you asked someone in Helensburgh who was the Provost 30 years ago, no-one would have a clue. But after all these years everyone knows of Henry Bell. "He has left his mark: Henry Bell Street, the Baths Hotel, the Comet flywheel on the esplanade, and at 52 East Clyde Street — that was my granny’s house at one point and it was the house that Henry Bell’s wife built and it was at one time the Helensburgh hospital. "The last time I was in that house, and it was many years ago, the brass rail going up the stairs came off the Comet. The house has been closed a long time, and I don’t know what is there now. "Then you have the obelisk in West Clyde Street, and the magnificent stone carving in Rhu Cemetery. So after all these years everyone still knows of Henry Bell. "He was quite a businessman as well. Every time I see the Waverley I think that there is a common denominator — the Waverley could not be viable to sail unless she goes down to the Thames and the Bristol Channel, and Bell had the same problem and took the Comet to Edinburgh. "He was the ingenious Mr Bell, as he was referred to. He had the Baths Hotel, and he was a member of the Town Council and gave himself a licence. There was a jetty just down from the Baths Hotel, and you had to come in there and go through the hotel and through the bar, coming or going! "Nowadays when you come out a hotel there is a taxi waiting. When you came out that one there was a horse and carriage, and it was Bell’s. 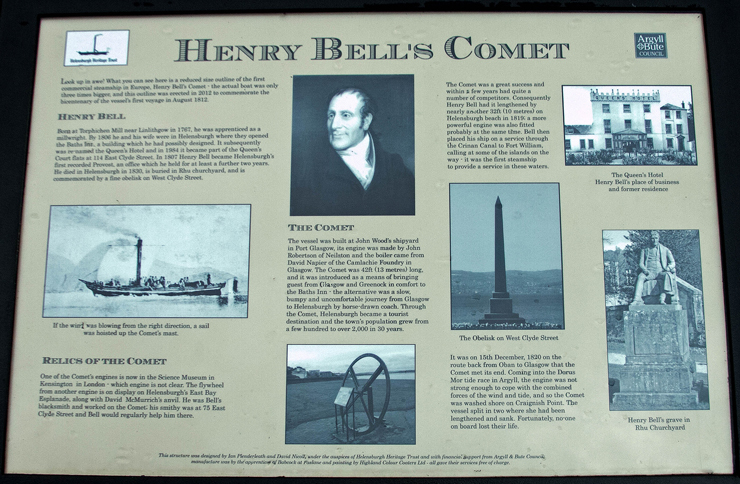 "Bell was perhaps the first man to bring tourism into Helensburgh, because his brother Thomas operated the horses and carriages between Glasgow and Helensburgh. "When you look out at the river and see the cruise liners there, this was the beginning of it all." The silhouette was accepted by Max Byrne of Waitrose. Ian Plenderleath, Neil Macleod, Stewart Noble, David Nicoll and Richard Schooling.